Or time for the personal to triumph? dominant culture, norms and traditions – prevail. Whose truth must we bear? by the loudest most vulgar or so it seems. 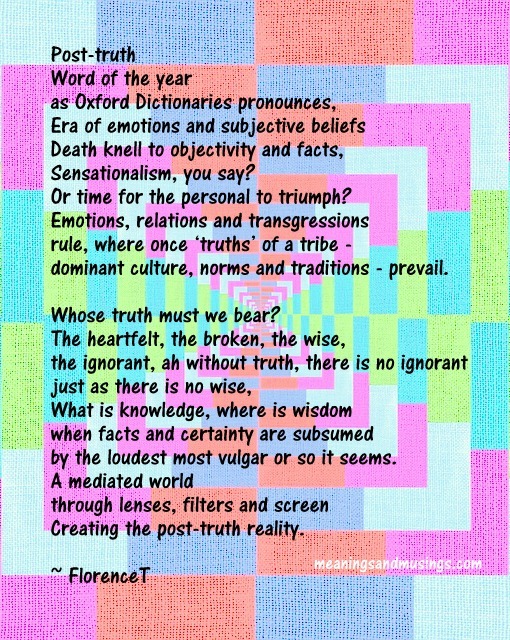 Oxford Dictionaries has declared “post-truth” as its 2016 international word of the year. “Post-truth”, an adjective, is defined as “relating to or denoting circumstances in which objective facts are less influential in shaping public opinion than appeals to emotion and personal belief“.